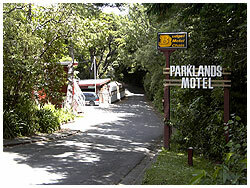 Tucked away in private native bush, Parklands Motel offers absolutely no road noise, just the sounds of the birds and the wind..
Parklands Motel is the perfect place for a quiet peaceful time away from home. Parking directly outside your unit. Play areas, trampoline, volleyball and petanque courts. Located at the gateway to the Rimutaka Forest Park, with numerous "back to nature" tracks and bush walks. To get back to civilization, Lower Hutt is a mere 10 minutes away, Wellington City and the Ferry Terminal only 20 minutes. During the summer season, there is an olympic sized swimming pool available 200 yards up the road and an 18 hole golf course only 10 minutes away, and then only a 1 hour drive to the seal colony at Turakirae Heads.